By clicking the install button above, you agree to our terms. 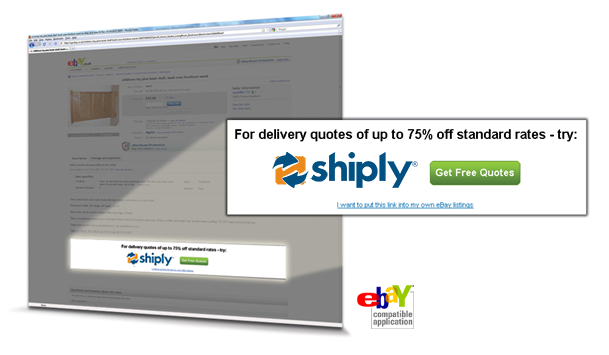 ShipLYNK automatically inserts a simple integration with Shiply.com into your eBay listing pages (see example to the right). We'll give you £1 - paid within an hour via PayPal! With up to 75% off delivery costs on Shiply - you can attract more bidders and a higher price for your items sold on eBay. Not so much a catch - but you do have to have a feedback score of at least 10 on eBay.co.uk and have listed more than 2 items to sell in the 90 days preceding 04/25/2019. You can read the full terms here. How will I get my £1? Once ShipLYNK has been installed on your eBay account, we will send you the £1 direct to your PayPal email address. I don't have PayPal, can you pay me another way? Sorry - no. But you can sign up for a free PayPal account here. Nice offer! Can I share this with friends? Yes, once you have installed your ShipLYNK we will give you a special "refer a friend URL". For each of your friends that goes on to install ShipLYNK successfully we will give both you and them £1 each! We're a fully certified eBay compatible application - we have undergone strict and rigorous tests by eBay. Further, we never actually see your eBay password, you enter this on eBay's own web site and not ours. If you're still sceptical (aren't we all), have a look at some of the press & media talking about us to get a feel for our great reputation. I've not heard of Shiply, what's this all about? The Telegraph said that we are "like eBay but for moving stuff". People list items they need to move and get quotes from over 19,000 transport companies. Over 200,000 people have used Shiply since 2008 and we've been featured in just about every major newspaper. No problem, contact our dedicated ShipLYNK support team at: . Office 404, Albany House, 324/326 Regent Street, London, W1B 3HH, United Kingdom.